“I have never thought that the national chairman was perfect. 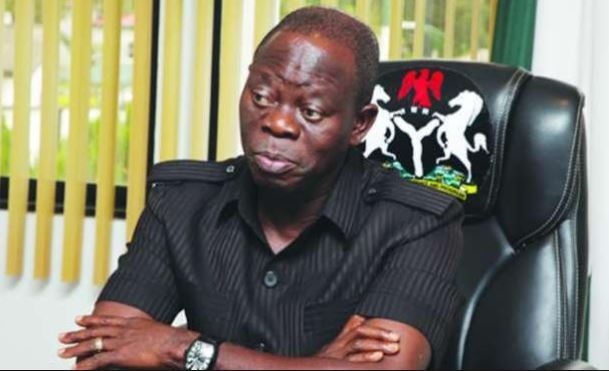 But I have always believed that he had the courage to do this job"
As the plot to remove the embattled Chairman of the All Progressive Congress Adams Oshiomhole thickens, the Edo State chapter of the party appears to have pitched its tent with him. The party has told members of the party, who lost the primaries, to count it out of the alleged plan to remove the national chairman, Adams Oshiomhole. The chairmen of the APC in the 36 states were reportedly said to be working with some high-ranking leaders of the party to call for a National Executive Committee meeting. Ojezua explained that the former Edo State Governor already had the backing of the chapter chairmen in the South-South and South-East, who passed a vote of confidence on him (Oshiomhole). “So, nobody can be talking about removing him (Oshiomhole),” he added. Ojezua also stated that with the strength of the APC in the country, a high level of desperation by the aspirants to get the party’s ticket did not come as a surprise. The state chairman said, “So, the level of discontentment is also higher when you do not get it. Naturally, people will be unhappy and so, what you have seen is the symptom of that unhappiness. “But the capacity to carry out any threat is limited because you will find out that we are said to have a problem in about four states. We have 36 states and the Federal Capital Territory. When asked whether the state chapter was satisfied with Oshiomhole’s performance as chairman, Ojezua said, “I have never thought that the national chairman was perfect. But I have always believed that he had the courage to do this job. “I am convinced that he still has the courage. Perhaps, there are a few things he could have done differently.